Anti-LGBT violence in Russia still continue on a daily basis despite the lack of reporting now that the Olympics are over. 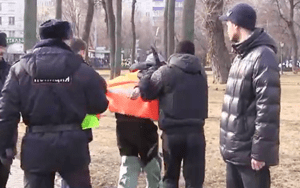 In the latest attacks a group of armed men were arrested in Moscow yesterday after they disrupted a gay rights demonstration for International Women’s Day by throwing eggs at the demonstrators and setting fire to their placards. 12 of whom were arrested after the attacks and are reported to have also been carrying concealed knives, crowbars, and machetes. LGBT activists Igor Iasine, Nikolay Bayev, Evgeniy Pisemsky, as well as several members of the Moscow Rainbow Association and other participants held rainbow flags and placards against homophobia and sexism yesterday. According to Grani.ru, Russian police demanded that rainbow flags should be removed from the rally shortly after the demonstration started, but allowed anti-gay protestors to continue. Violence broke out shortly after, when a group of armed thugs attacked the LGBT campaigners with eggs and attempted to burn down their placards.